We Had It Right In Our Hands and Let It Slip Away! Joan and I have been devastated by not collecting on our winnings in the $1 Billion Powerball lottery. Because Nevada does not support the lottery (they want your pocket change spent in the casinos) we made 2 special trips into Arizona to purchase tickets for ourselves and some of our co-workers. 1 trip on Saturday when the lottery was a measly $400 million and another on Wednesday for the Big One! Collecting our winnings you ask?...Yes that's right, we actually had a winning ticket. We hit the Powerball on one of our tickets, which we later determined would have been worth $4 if we hadn't thrown it away! Alas, looks as though we'll have to continue to live the lifestyle to which we have become accustomed. 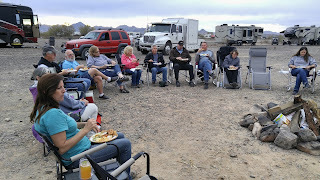 So after the heart-wrenching lottery loss, 2 weeks of grueling volunteer work and knowing that we would need to have the motorhome serviced for us to continue to full time, we scheduled some work on the MH and planned a trip to Quartzite and points south. Woohoo! 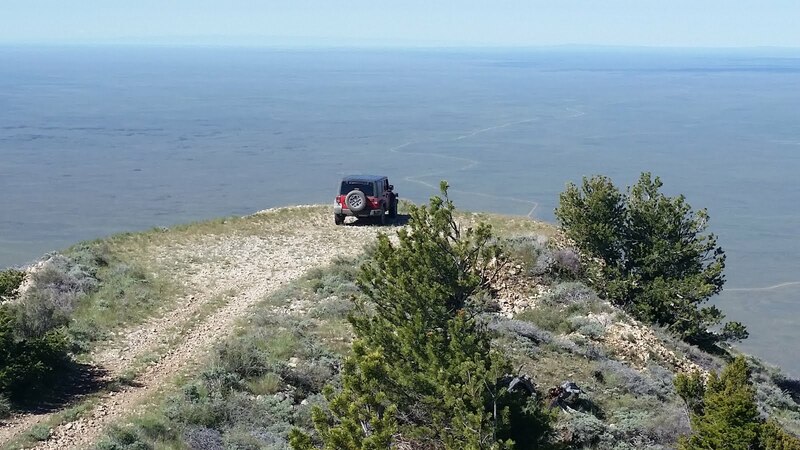 We dropped off the MH on Monday and headed to Quartzite; about 4 hours away. We arrived a little after lunch and went straight into the big tent to see Rudy & Phil (Workin' RVers). 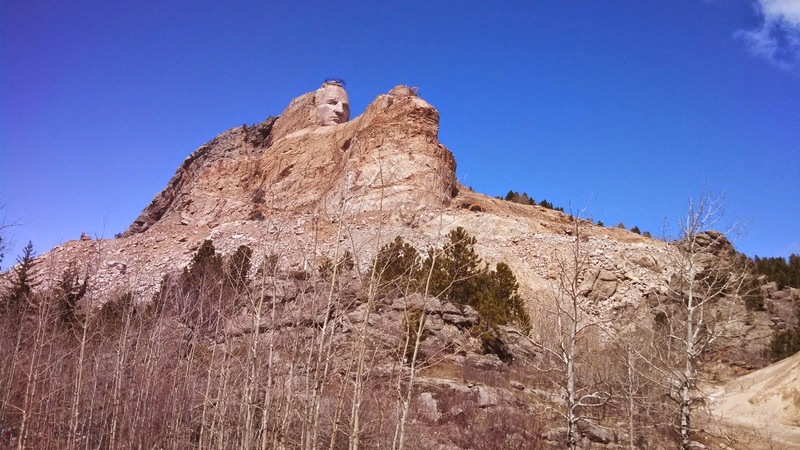 Last year Rudy & Phil both took full time positions at Crazy Horse Memorial just outside of Custer, SD. They were at Quartzite recruiting workampers and promoting Crazy Horse as a vacation destination. After chatting awhile, we meandered in and around the big tent checking out all the other vendors and products. We stopped to purchase a couple of new outdoor folding chairs before heading to our hotel. Tuesday we met up with Jim & Barb (JimandBarbsRVAdventure) to check out some new & used RVs before heading out to their boondocking site just outside of Quartzite. Later that afternoon we joined Jim & Barb attending a social/cocktail hour/fish fry with several other RV Dreamer boondockers. Wednesday we headed about 90 miles west for an Agricultural Tour sponsored by University of California. 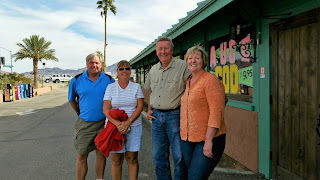 Our friends from Lake Mead, Don & Ginny joined us as did Jim & Barb. The tour took place at a 255-acre research farm in Holtville, CA. 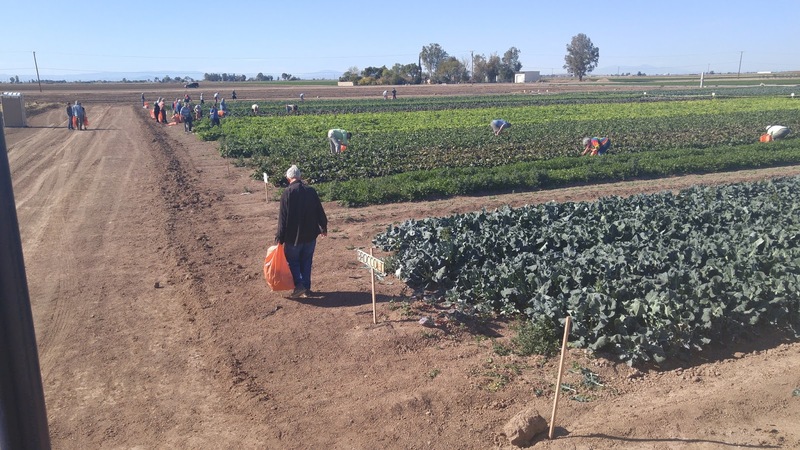 5) a U-Pick opportunity to take home fresh vegetables such as radishes, beets, broccoli, turnips, and lettuce; 6) door prizes; 7) Ice Cream! 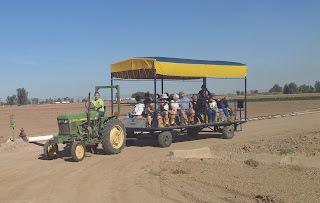 The experience was informative and fun. 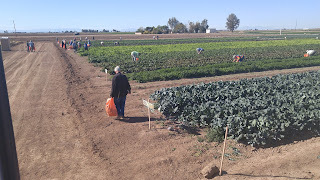 And we scoped out the farm as a potential volunteer opportunity sometime in the future. 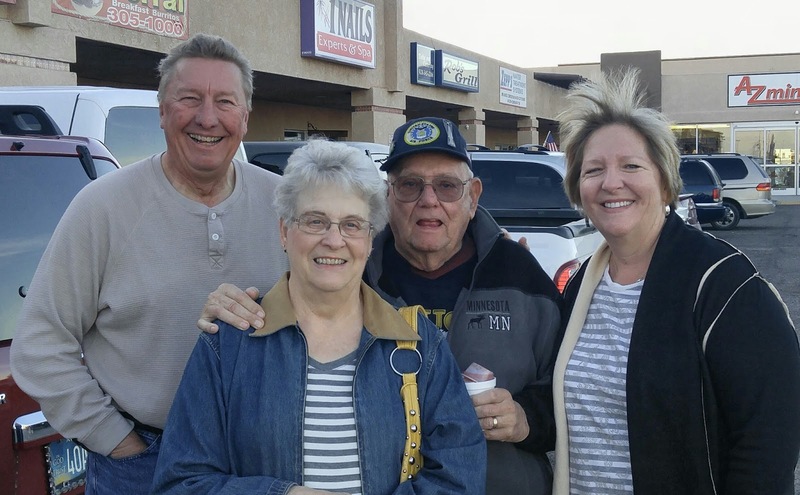 Thursday we were in Yuma to spend some time with our friends Don & Donna. We met Don & Donna while we were in Oregon on our 1st workamping job. They were experienced workampers and taught us some of the ropes that season. Not only did we get to catch up with them, but we got to play lots of cards and board games! And before we left Yuma we met up with Kevin and Evelyn (RV Kronicles of Kevelyn). Joan & I have followed their blog for some time now and we just couldn't pass up the opportunity to meet them in person. Based on their plans for the future, it's very likely we'll get to see them again during our travels. 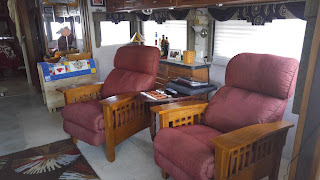 While we were in Quartzite we had received a call from the repair shop where the motorhome is being serviced. They identified 2 important issues that needed to be addressed; 1) a cracked and leaking exhaust manifold and 2) a bad injector in cylinder #1, both of which we approved to be repaired. 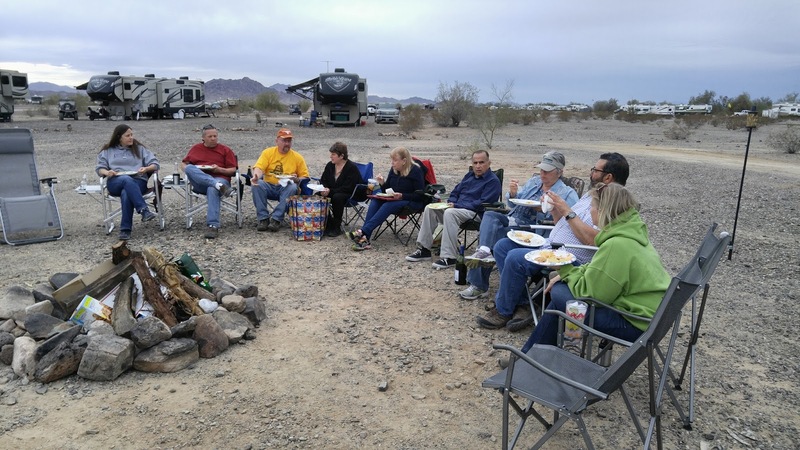 Friday morning we left Yuma planning to be in Vegas by 2pm to pick up the MH and get set up back in the volunteer campground before dark. We arrived at the repair shop on time only to find out that a replacement injector had to be ordered out of Reno and would not arrive until Monday. Now we were homeless for the weekend. A quick call to Joan's cousin Theresa and we were invited to spend the weekend with them in North Las Vegas. 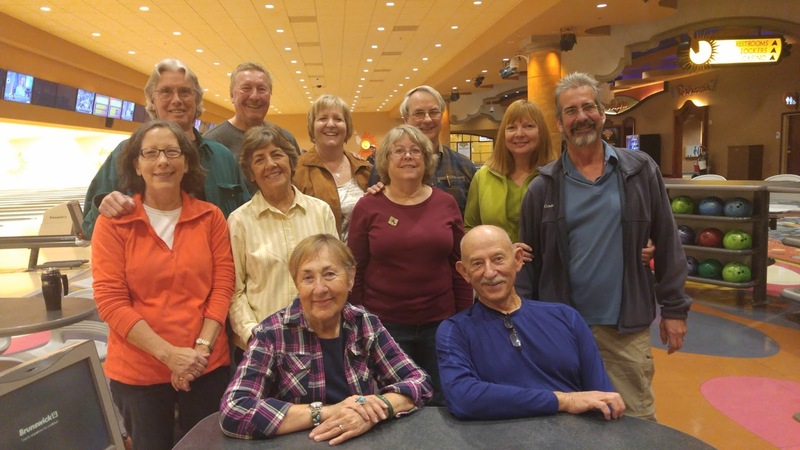 It was a fun weekend with a movie (Dirty Grandpa) Friday night; a trip into 'Chinatown' for massages Saturday; and a short road trip to MT Charleston and Red Rock Canyon Sunday. 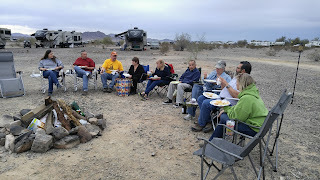 Monday we picked up the MH and returned to our campground in Lake Mead. One of the things that we did accomplish this week was the finalization of our living room remodel. 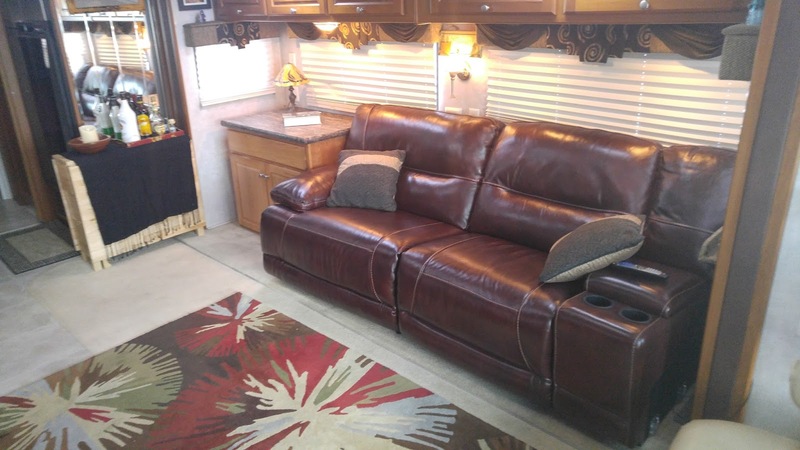 When we bought our MH in 2010 it came with a small 'futon' style couch in the driver's side slide facing the TV/entertainment center wall. The remaining space in the driver's side slide was taken up with a 10" deep 'buffet' style cabinet, barely deep enough to store anything other than small packages of kitchen utensils; and it held a fixed dining room table top that projected into the room 24"-36" inches. Before we went full-time in 2012 we removed the table top in favor of a portable double-wing folding table from IKEA and replaced the uncomfortable couch with IKEA pong chairs. 1 year later we upgraded our chairs with Lazy Boy recliners. This year we were thinking it was time for something new so we got rid of the recliners and buffet style cabinet to install a couch and larger cabinet (not quite as wide as the original, but much deeper). Boy! What a difference that made. The new power reclining couch is a 'wall-hugger' model with a footprint that fits entirely within the depth of the slide. 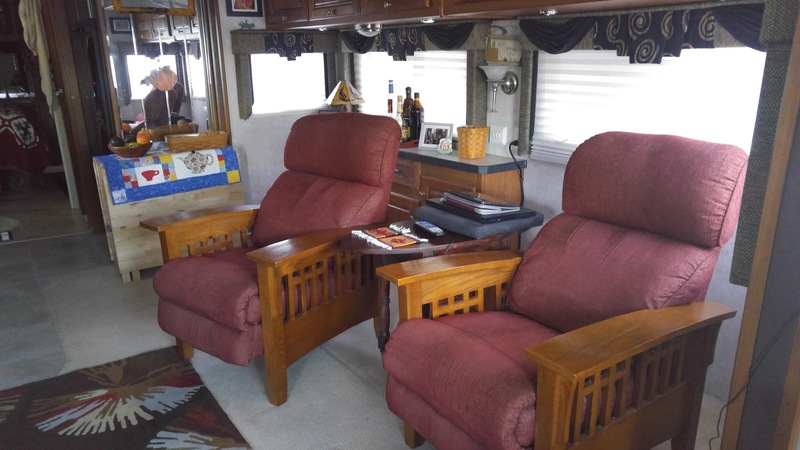 Neither of the recliners would fit within the slide as they had to sit off the wall so they could recline; and when reclined they extended 1'-2' into the room. With the new couch, the entire width of the living room floor is open; many of our neighbors have described it as a dance hall! 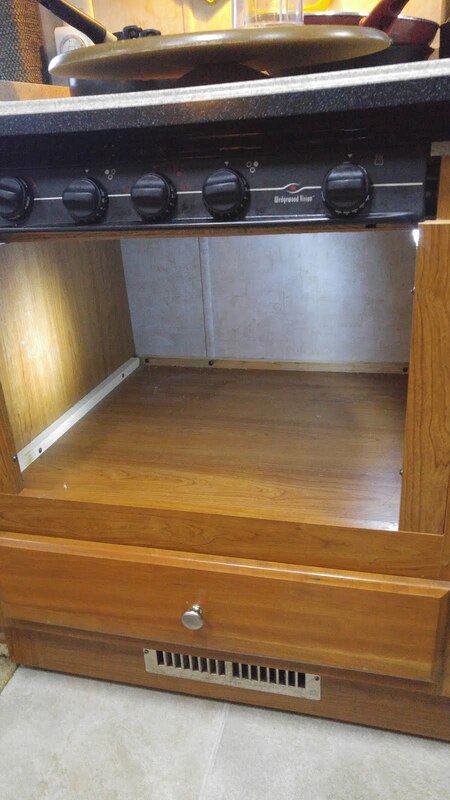 And the new 24"deep x 36" wide cabinet has 3 slide out drawers with tons of room for whatever Joan desires. Out with old; In with the new! If you remember our last blog we mentioned the oven removal and cabinet redesign in its place. 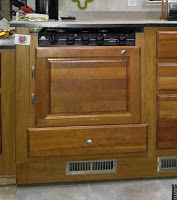 Like the oven/cabinet project I removed the old buffet cabinet and installed the new cabinet using a few hand tools. 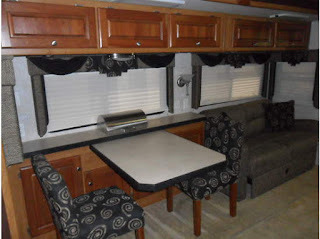 The estimate to have both of these projects done by an RV remodeling company was $4700.00. I was able to do both myself for just under $1500.00. Yahoo! Yesterday our gang got together and we all went bowling. 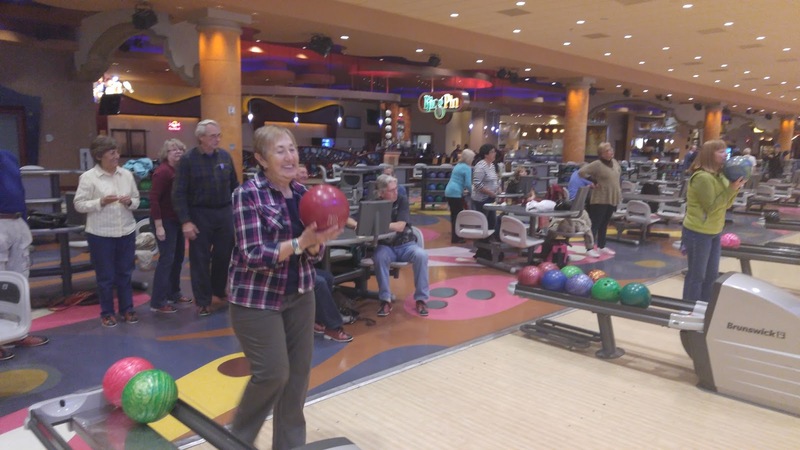 Many of the large casinos in Vegas have bowling centers. The Sunset Casino has 72 lanes; it is very well decorated, clean and comfortable within. And on Friday mornings we can bowl for $1 a game...hard to beat that. Hello everyone and Happy New Year! 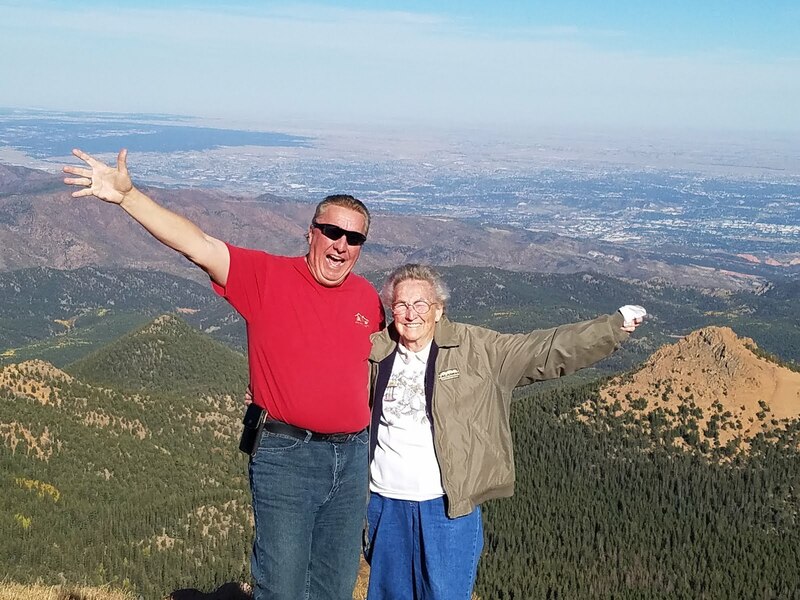 Joan and I have had a great start to the new year; enjoying time with friends and family; completing some mods and repairs on the RV; and planning for 2016. 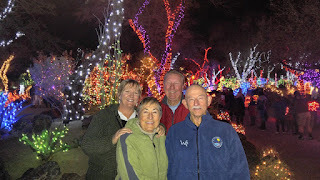 One of the things we like to do each Christmas season is visit the Botanical Cactus Gardens in Henderson. 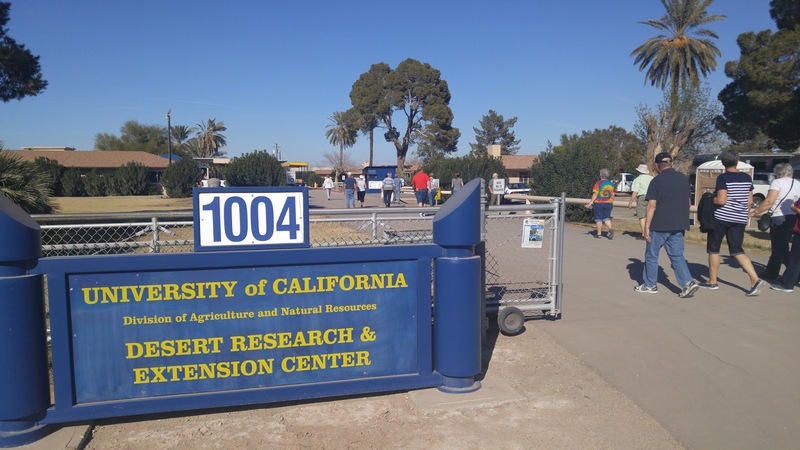 Ethel M's is the largest in Nevada and one of the largest collections of its kind in the world; it covers 4 acres and contains over 300 varieties of cacti and succulents from around the world. 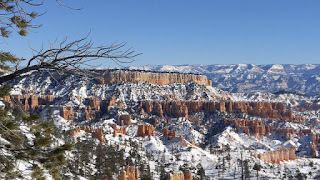 If you want to see the cactus, you need to visit during daylight hours. But if you're interested in Christmas lights, it's best to visit at night. For the last 22 years, workers have decorated the cactus garden with over half a million Christmas lights. I'm not sure how much the decorators get paid, but it's not a job I would want as the lights are placed directly on the cactus. I hope they're wearing some sort of chain mesh gloves because there are lots of spikes and thorns. We had a visit from Jim & Barb of JimandBarbsRVAdventure. They were exiting cold weather in Salt Lake headed for Quartzite. 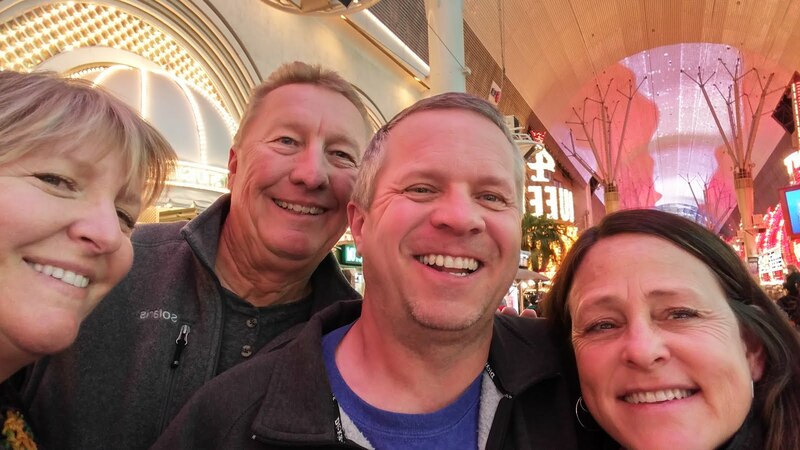 They had never visited The Strip so we took them down to Freemont St. What a hoot! It was only Wednesday, but many of the characters were out in full form. Joan's long time girlfriend from Seattle, Terry came into town over Christmas and stayed a few night with us. I'm telling you she's a bad influence on Joan! The first night in town she and Joan cruised Las Vegas Blvd and the Strip until 3am! And then Terry introduced Joan to Pai Gow poker. 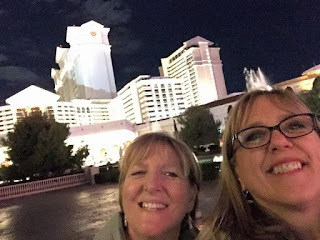 Joan's been suggesting we stop in one of the casinos and play almost every other day! And this from my wife who had bragged that we did not drop a quarter into a slot the first 2 years we were in Vegas. The weekend after Christmas Joan & Terry drove north into Utah to visit Zion and Bryce National Parks. 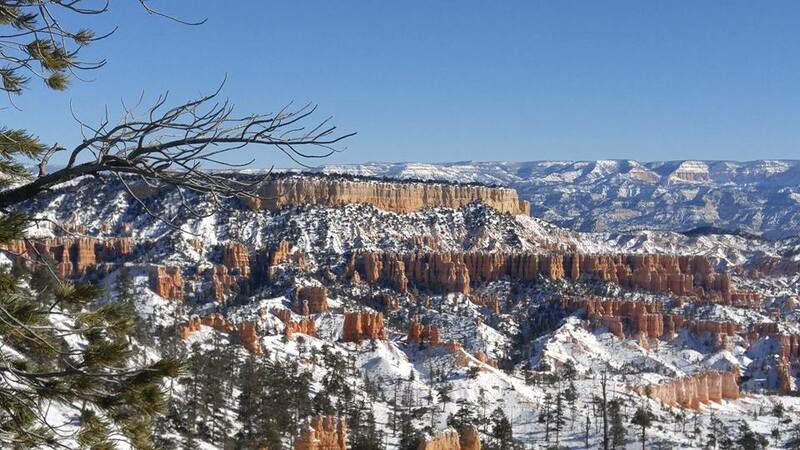 The temps got as low as -9 overnight while they were there. BBBRRRRRRR! While they were gone off to play, it was all work for me. Our MH came equipped with both a gas oven and convection/microwave oven. After several attempts to use the gas oven, neither of us was impressed as it was awkward to light and poor to cook with. In fact we stopped using it altogether in favor of the convection oven. For the last 3 years it was a storage bin for a couple of frying pans. After looking at how the gas oven and gas burners were designed, I was fairly confident I could remove the oven and keep the stove top burners. So I turned off the gas into the MH before completely removing the oven and attached stove top. I separated the stove top burners from the oven, then built a platform to support the burners in their original position. 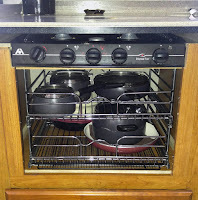 I remounted the stove top burners, sealed off the oven pilot light, gas and thermo-coupling lines before reconnecting the gas line to the burners. I tested the burners and everything worked as it should. This left us with a 2' wide x 20" tall opening in our kitchen cabinets. A quick visit to Lowes and we picked up a 2-tier sliding drawer rack that would fit into the opening. I retrieved a cabinet door left over from a previous cabinet mod we had done and determined we could modify it to fit the cabinet opening. I trimmed the opening in the cabinet and mounted the trimmed cabinet door with left over hinges and hardware. Joan was thrilled with the additional storage space and I was happy with the finished look and cost savings. 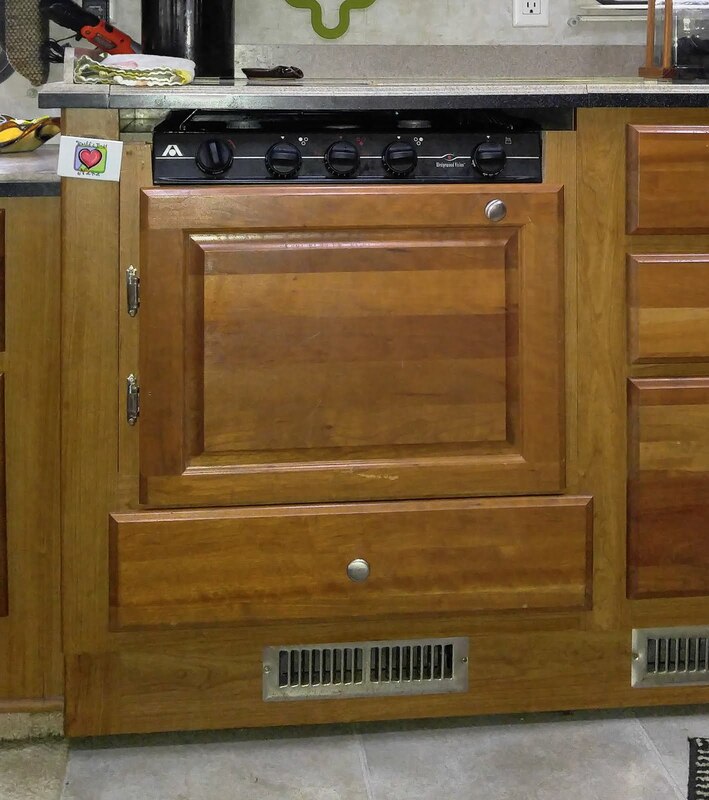 When we originally considered this change, we had an estimate done to remove the oven and replace the cabinet. That estimate came in at $1700.00. I managed to do this work for less than $125.00, sliding rack included. And I did it with an electric drill, jig saw and hand tools. I don't consider this a difficult mod to do. 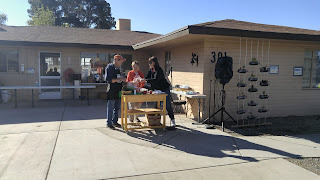 Even if I couldn't have reused the original burners, a new stove top can be purchased for less than $200. We're working on another major mod in the MH and I hope to be able and share that one with you in the next blog update. Shout Out to Jim & Deb back in Florida. Both of them have retired and moved into their MH full-time. Their plan is to be on the road by the end of January and joining us for the summer. Wahoo!